Move over hummus! 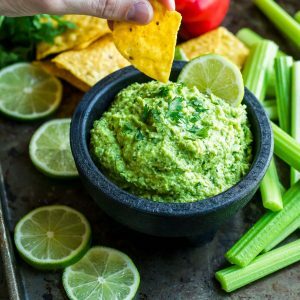 This tasty Cilantro Lime Edamame Dip is crazy healthy and packed with protein, fiber, and SO MUCH FLAVOR! Today I’m here to insist you just say NO to boring dips! Not to say that there is anything wrong with plain hummus and carrots or guac and chips, but give me a unique flavor combo and I am in dipping HEAVEN. This zesty bean dip was a crazy random kitchen experiment gone oh-so-right and I basically lost my mind over how good it was! Paul and I happily inhaled the entire bowl while standing over my little photog set up by the window and already plan on making another bowl this weekend to share with friends. I can’t wait! 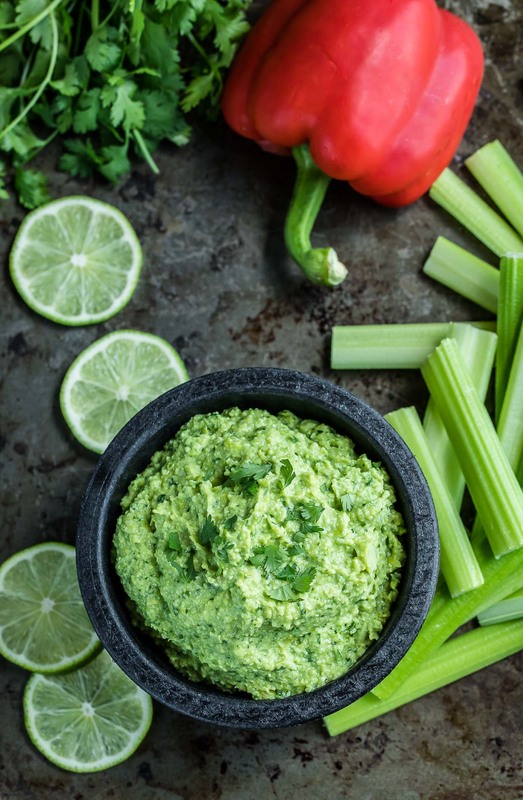 This gorgeous green cilantro lime edamame dip is spiked with creamy avocado, spicy jalapeño, and a little garlic for good measure. 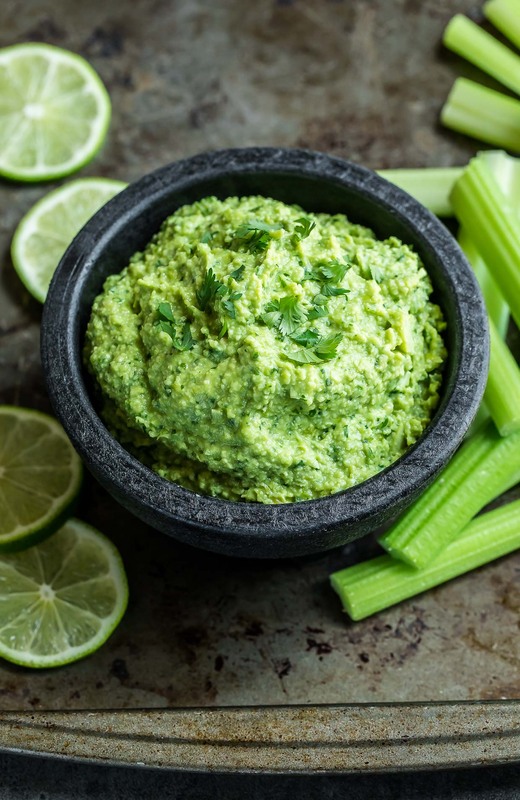 The whipped edamame adds an awesome punch of fiber and protein, helping keep things light and healthy, while the cilantro lime flavor combo helps amp up the flavor. Gah! We’re all about it! I refuse to ramble on another moment. You have GOT to make this healthy veggie dip. Right now. RIIIIIGHT NOWWWWW. Snack time just got a whole lot sassier! Ready in just 18 minutes, this crazy healthy dip is ready to rock your veggies! Serve it up with fresh sliced veggies and crispy tortilla chips. In a small pot, bring 3 cups of water to a boil. Add frozen edamame and boil until tender, approx. 6-8 minutes. Drain, cool, and remove soybeans from their pods. Remove the stem and seeds from your jalapeño. For a spicier did you can leave the seeds in tact. I added 1/4 tsp of the seeds back in and it was my perfect degree of heat - totally customize the spice to taste here. 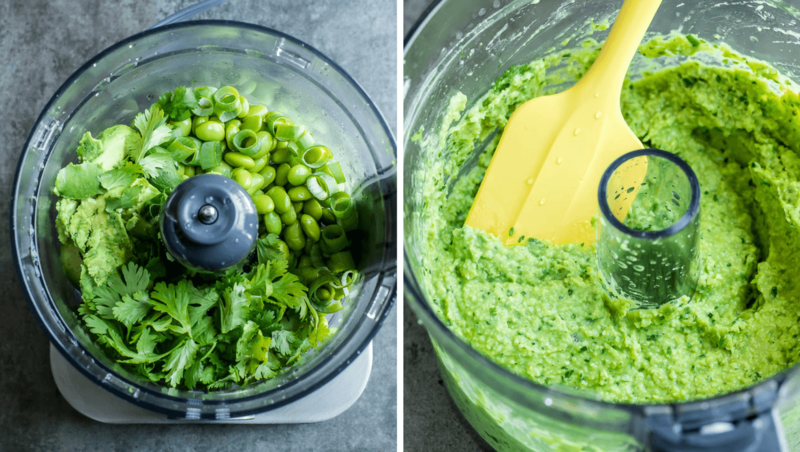 In a food processor, combine edamame, jalapeño, avocado, lime juice, green onion, cilantro, salt, and pepper. Pulse until finely chopped and mostly pureed, scraping down the sides once or twice as needed. With the processor running, slowly drizzle in the olive oil. Once incorporated, scrape down the bowl and then process for another 10 seconds or so. Add any extra needed/desired. Adjust seasoning to taste and serve with your favorite sliced veggies and tortilla chips. Enjoy! For an extra creamy dip, feel free to add in an extra avocado. To maintain flavor, simply adjust seasoning to taste by adding extra of your favorites. 1/8-1/4 tsp of cumin is also super tasty in this dip if you're a fan. Choose your favorites for dunking! Tortilla chips, sliced bell pepper, carrot sticks, celery sticks, sliced cucumber, pita wedges and pita chips all work marvelously! CRAZY DELICIOUS! 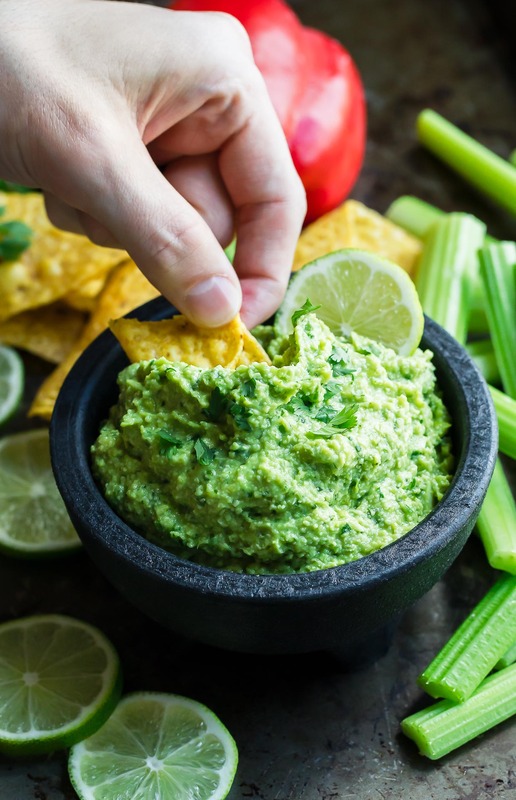 You can play with the creaminess by adding an extra avocado (I left a little note in the recipe card about this) to the mix and make this dip as mild or as spicy as your heat desires! We went for slightly spicy, adding just a few of the jalapeño seeds back in but you could leave all the jalapeño seeds in tact for a crazy spicy dip, or skip the seeds altogether for a more mild dipping experience. The latter is probably best if you’re sharing this snack with kiddos. 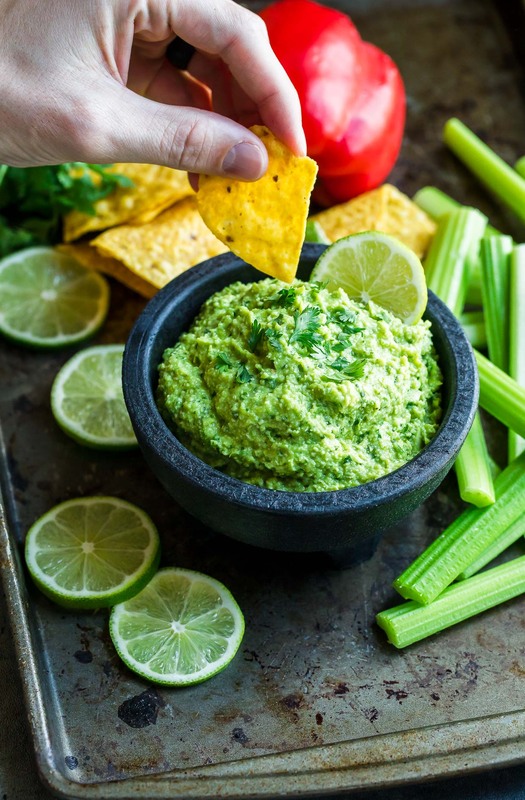 If you get a chance to try this cilantro lime edamame dip, let me know! Leave some love in the comment form below or tag your photos with @peasandcrayons on Instagram so I can happy dance over your creation. I can’t wait for you to try this easy edamame dip! I have shelled edamame. How many cups of edamame beans would 19 oz of pods need? Thank you!!! Hi Lorrie! If you’re making the single batch of the recipe from the post it’ll be 10 ounces of pods so 1 cup of shelled edamame, I believe. I have a bag in the freezer RN so let me double check and get back to ya just in case! Is it okay to make it ahead of time. Worried about avocados turning brown. Hey Angela! I haven’t successfully had leftovers yet (we whip it up and go to town on this dip LOL!) but I believe from past experiences with avocado in bean dips that the edamame and limes should keep it from browning if you make it the day before to snack on! I’m not 100% but let me know if you try it! I have to shoot over to the grocery store on Sunday/Monday so I’ll add everything to my grocery list again to give it an advance prep test run too! I tried this recipe and wish i made more of it. It was so yummy and a crowd pleaser. I didn’t have frozen edamame so I cooked my dried soy beans. I added a ton of fresh garlic and it made it nice and spicy. Thanks for the inspiration. 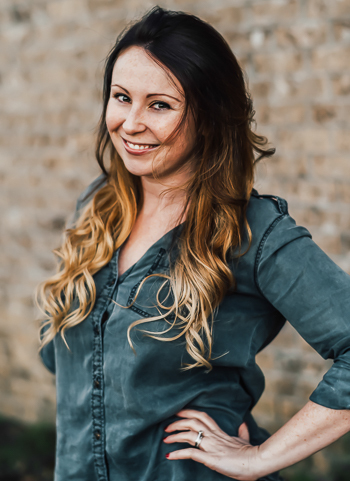 So happy to hear it Cheryl thank you! This looks like it’s going to be my new favourite dip. I love everything about it! Thank you Rosemary! I’m totally smitten with it! This sounds like such an addicting dip! I love the combination of flavors! Soooo gooooood! Thank you Madi! So a decade ago I made pea- guacamole. I still vividly remember it, It was a failure, peas have a distinct flavor. This recipe looks more like what I should have tried.